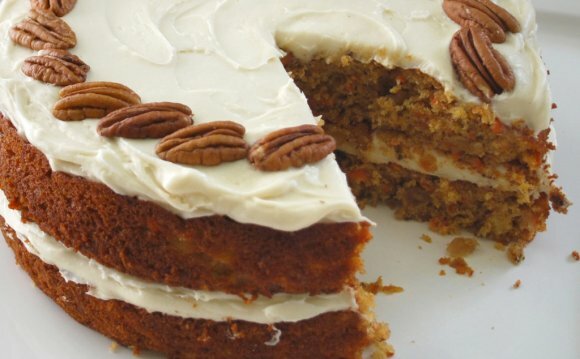 This is the absolute best (if I do say so myself) Gluten Free Carrot Cake recipe around. This one bowl cake is deliciously moist and super easy and it is one you will make again and again. And you’d never know it is gluten free! Even if you aren’t on a gluten free diet my Gluten Free Banana Cake is one delicious cake. In fact I made the banana cake twice for my husbands family while we were visiting them in Adelaide over Christmas, and each time this cake disappeared just as quickly as 2012 had done because everyone loves a good banana cake. When we came home from Adelaide I had a sudden craving for carrot cake, which I haven’t had in the longest time, usually because I find them overly oily and heavy, so I resolved to turn my gluten free banana cake recipe into a gluten free carrot cake. And it worked out brilliantly! The beauty of this gluten free cake is that it is so simple to make. There is no need to cream butter and sugar, in fact there’s no butter in this recipe at all. All you need is a food processor to first grate the carrots, and then blitz all the ingredients together. Of course you could grate the carrots by hand, but since you will have the food processor out anyway why not put it to good use? While I was tempted to go with my cinnamon cream cheese frosting, which by the way I think would work brilliantly with this gluten free carrot cake, I went for a lemon cream cheese frosting. I grew up eating carrot cakes with lemon cream cheese frosting, so lemon cream cheese frosting it had to be for me. Next time though I will make this with the cinnamon cream cheese frosting because I will definitely be making this cake again. All content on Delicious Everyday is Copyright © Jennifer Schmidt and written permission is required before republishing any content from Delicious Everyday. Please contact me to discuss before using any of my images or recipes.